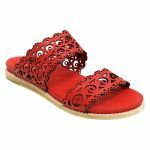 Hermon by Top End is a cute laser-cut flat summer sandal. Slip this on with any outfit ranging from casual to smart and let your feet do all the talking! 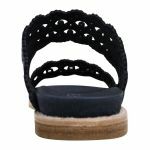 This lovely sandal has a sunken insole with raised edges giving you the feeling that this slide is hugging your foot everytime you wear it. The sole is flexible giving you ease to move with every step and the gorgeous deep navy compliments almost any colour palette!